Too wild and wet and windy today to do what I had planned, so here's some pretty flowers, and yes, the one in the top left corner is dead; I like dead flowers. 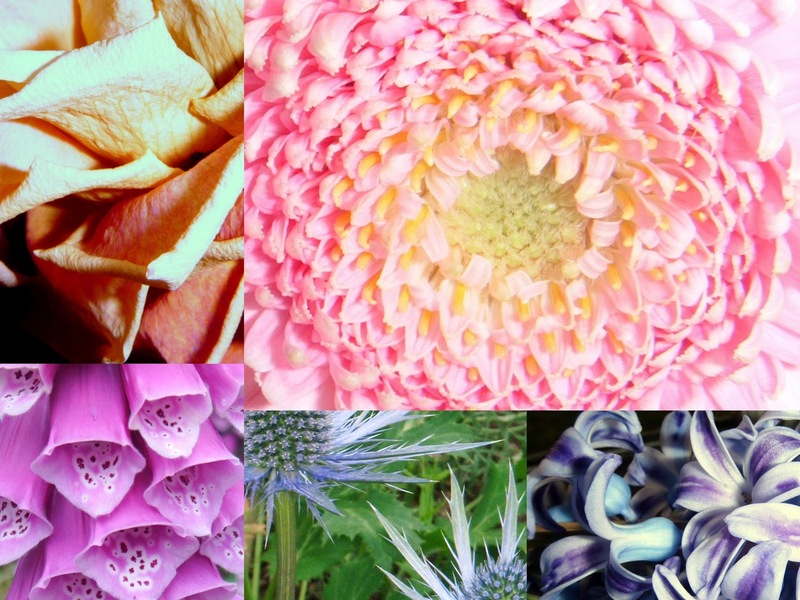 Beautiful pics and so happy to know that I'm not alone in seeing the beauty in faded blooms! Fun mix of textures, colors and shapes, no lack of variety in the natural world. While others are leaving flowers on the streets of Paris, you are leaving them here. They are gorgeous and the colors are so pretty and calming. That must be a rose in the upper left. Those curled petals certainly look like it. I love when lots of petals fall to the ground and color the earth. Guess you can say I like dead flowers, too. You made me chuckle Kaja. Beautiful photos and yes, I like dead flowers too. I especially love it when small flower petals cover the ground, like snow.